This book revisits many aspects of current social science theories, such as actor-network theory and the French school of science and technology studies, to test how the theories apply in a specific situation, in this case after 1991 in the city of Cherepovets in Russia, home of Russia’s second biggest steel producer, Severstal. Using political philosophy to analyse the down-to-earth details of the real techno-scientific problems facing the world, the book examines the role of things - and urban infrastructure in particular - in political change. It considers how the city’s infrastructure, including housing, ICT networks, the provision of public utilities of all kinds, has been transformed in recent years; examines the roles of different actors including the municipal authorities, and explores citizens’ differing and sometimes contradictory images of their city. 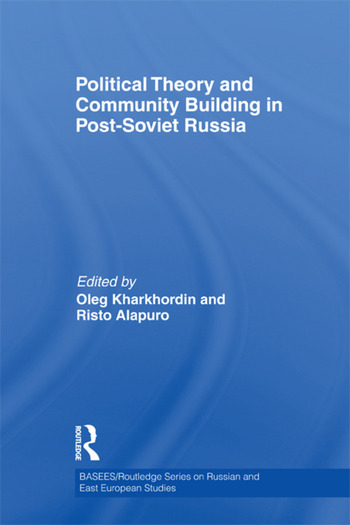 It includes a great deal of new thinking on how communities are built, how common action is initiated to provide public goods, and how the goods themselves - physical things – are a crucial driver of community action and community building, arguably more so than more abstract social and human forces. Oleg Kharkhordin is Professor at the Department of Political Sciences and Sociology, The European University at St. Petersburg, Russia. His publications include The Collective and the Individual in Russia: A Study of Practices, and Main Concepts of Russian Politics. Risto Alapuro is Professor of Sociology at the University of Helsinki, Finland, and the head of the Helsinki Group for Political Sociology. His publications include State and Revolution in Finland, and as editor Beyond Post-Soviet Transition: Micro Perspectives on Challenge and Survival in Russia and Estonia.